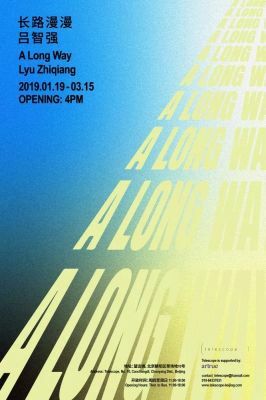 Based on the artist’s childhood memories of the 1980’s in northeastern China, the main exhibition space has been transformed into a waiting room; a railway or bus station, an elementary school, a hospital or public government building, etc. A blue Wainscot band of paint covers the white walls, and pale yellow wooden benches line the room for sitting, waiting, and listening. Sheer white see-through curtains cover the windows sealing off the outside world and its distractions. In the middle of the room a display pedestal holds an anonymous ‘travel’ book of random photos of unknown places for the waiting ‘passengers’ to view. On one wall is a strange lone ‘work of art,’ an abstract perspectival drawing of some misplaced and unknown dimension, a journey without beginning and without end. Perhaps it’s the Twilight Zone destination of those waiting for their train. The room has a “socialist” décor of that period; simple, no frills, and almost devoid of any feeling except for the rich layered sounds that fill the air with a continuum of aural images from distant places and times. In the adjacent room is a single video work seen through the windshield of a car traveling down a highway. This is a 9 hour unedited video made by an automobile data recorder of a journey Lyu made from Jiagedaqi in Inner Mongolia to Mohe, Heilongjiang, his hometown, in northeast China. The video camera is never ‘paused’, he records everything that happened along the way capturing the music he listened to and him cleaning the windshield of his car at a gas station. It is less of an independent work of art to Lyu and more of a continuation of the ambience of the entire exhibition. Lyu is not only an artist but also a DJ and a university teacher of experimental art. Sound and music infuses all that he does. The ‘soundtrack’ for this exhibition is not just a field recording but also a brilliantly composed and paced piece of experimental music. It goes beyond the borders of just sound into an unearthly voice that delves deep into the spirit and the soul, and if one has the ears to hear it can awaken the eyes and open the doors of memory, create new worlds, break open old wounds, and then suddenly heal them, it can take the listener on a journey through the time and space of their own lives. Music has a way of doing this and when coupled with the visual, it is as uplifting as it is dangerous.